As I suggested in the previous post, a substantial number of scenes in Mat Sentul’s “Mat Tiga Suku” were filmed in and around the vicinity of the Cathay-Keris Studios in 532-D East Coast Road, and that was probably due to budget constraints and out of convenience for the director and the film crew. It could be that the surrounding regions of the film studio were deemed appropriate enough to inspire Mat Sentul to crank out his trademark gags and physical humour. The Cathay-Keris Studios in 532-D East Coast Road were built in 1953 when Cathay Organisation boss Loke Wan Tho teamed up with Ho Ah Loke to form Cathay-Keris. (Ho originally ran a film company called Keris Film Productions.) The studios’ compound had comprised of former barracks used by the Japanese. Two large “aircraft-hangar-like” studios were added and the barracks were converted to offices and a canteen. The location at East Coast was probably selected because it was adjacent to Cathay-organisation-owned Ocean Park Hotel. It was also in a more convenient location closer to town than Keris Film Production’s former tin-shed studios along Tampines Road. In the early 1960s, a new private housing estate commonly known as the Cathay Gardens was also built on land adjacent to the Cathay-Keris Studios and Ocean Park Hotel. The network of roads within the estate were named such that they had relations to Cathay-Keris’ film production history. For example, Jalan Buloh Perindu was named after the studios’ first film “Buloh Perindu” (1953), which was also the first Malay film to be shot and released in colour. Jalan Saudara Ku, Jalan Dondang Sayang, Jalan Selendang Delima, Jalan Puteri Jula Juli were all named after films produced by Cathay-Keris in the 1950s. 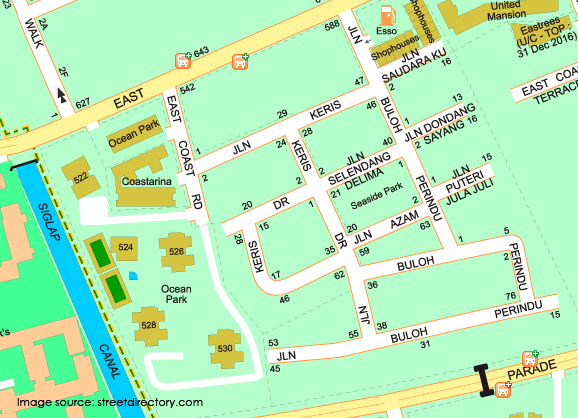 An updated street map of the Cathay Gardens and the adjacent Ocean Park today. The site of the demolished Cathay-Keris Studios is now taken up by private low-rise terrace houses along Keris Drive and Jalan Keris. The former Ocean Park Hotel was also torn down to make way for the high-rise Ocean Park Condominiums. 5. Jalan Buloh Perindu, off East Coast Road. Early in the film “Mat Tiga Suku”, Mat Sentul receives a horde of cash from a talking spirit lurking in his dilapidated house. He dresses himself up in a lounge suit and tie in order to look like a rich gentleman, and struts down the sidewalk along Jalan Buloh Perindu, in the vicinity of Cathay-Keris Studios. Left: Aerial photo of the Cathay-Keris Studios and Jalan Buloh Perindu in the 1960s/70s. The red circle on the left image points out the location of the shot in the film. Houses No. 39 and No. 41 are also identified in both the aerial photo and the film-stills. House No. 39 on the left, No. 41 on the right. Except for minor alterations and extensions, they still look the same as they were when Mat Sentul tripped over his own leg on the sidewalk next to these two houses back in 1964’s “Mat Tiga Suku”. House No. 33, Jalan Buloh Perindu. A comical policeman stands at attention and greets Mat Sentul who is dressed up as a rich and suave gentlemen. The above-mentioned House No.33 Jalan Buloh Perindu, appears to be one of the houses featured in this scene, on the left in this collage of film-stills. Collage of film-stills from “Mat Tiga Suku”. Mat Sentul’s antics in the neighbourhood arouse suspicion. Shot along the same stretch of Jalan Buloh Perindu as the previous collage of film-stills, but here the camera is pointing eastwards. Jalan Buloh Perindu and the layout of the neighbouring roads in the Cathay Gardens vicinity has changed little since the time when “Mat Tiga Suku” was made, except for the addition of Keris Drive when the film studios were demolished to build new private houses and access roads. What has changed significantly are the appearances and designs of many of the houses as they switched ownership or underwent renovation. I also noticed that Mat Sentul’s Jalan Buloh Perindu neighbourhood in the 60s had little greenery, but the same neighbourhood today is very well-shaded by trees planted on the sidewalk. A vintage car with a policeman in the driver’s seat makes its rounds in Mat Sentul’s neighbourhood. This was shot at the far end of Ocean Park Hotel, right next to the coastline. Left: Aerial Photo of Cathay-Keris Studios and vicinity. The red circle marks out the location of the film scene depicted above — a seafront bungalow at the far end of Ocean Park Hotel, which lies to the left of the photograph. Right: The same spot is occupied by the carpark of Ocean Park Condominium today. The comic policeman spies on the seafront bungalow from a distance. An open field and mini garden close to the seafront bungalow in the Ocean Park Hotel. The sea can be seen on the left in the collage. 7. Cathay-Keris Studios. 532-D, East Coast Road. Mat Sentul is up to mischief again and deceives the jaga so as to gain entry to a privately-owned company’s office space. This seems to be shot at the entrance of the former Cathay-Keris Studios. The road on the left is East Coast Road, a minor road off the major East Coast Road thoroughfare. Film-stills from “Mat Tiga Suku”. Mat Sentul pretends to be a clerk and makes a mess of receiving multiple phone calls at once. He is discovered by a genuine office staff and escapes through a side window. Probably shot in the one of the office spaces of the Cathay-Keris Studios. Mat Sentul pretends to be a doctor and goes through a routine of silly gags involving his pursuer and a helpless handicapped patient. This was shot along the corridors outside the Preview Theatres in Cathay-Keris studio. Probably the former barracks used by the Japanese army during the Occupation. 8. Private housing and barber shop in the vicinity of Cathay-Keris Studios? Film-stills from “Mat Tiga Suku”. Mat Sentul irritates a hapless owner of a twin-storey terrace house and a car which Mat Sentul is employed to clean. The exact location of this scene is unclear to me but it seems to be in the vicinity of the Cathay-Keris Studio. Mat Sentul spreads rumours of a calamity in a neighbourhood barber shop, and all the customers and barbers emptied out of the shop, leaving Mat Sentul to wreak havoc with a new incoming customer’s hair. Could this typically 1960/70s barber shop be in the vicinity of Cathay-Keris Studios? “Padamkan segala berita angin”, by the way, literally means “extinguish all rumours”. Conclusively speaking, “Mat Tiga Suku” is neither a groundbreaking work of film art nor one of the best films in Cathay-Keris’ oeuvre. It contains many cheap gags and silly (but funny) comic sequences. And that was probably Mat Sentul’s wish (and then-studio-executive Tom Hodge’s wish), for the film to be low on budget, to raise a few chuckles and fulfill its role as plain comedic entertainment. Inadvertently, this innocent and free-spirited film does raise my eyebrows a fair bit because of its clever use of real locations in 1960s Singapore — especially of Mat Sentul’s bus-stop-moving gag in the newly reclaimed land on Singapore’s East Coast. That would suffice for me to make a mention of this film in this obscure blog of mine. Finally, finally, I offer you the following collage, of film-stills extracted from a gag Mat Sentul conjured up in the kampung — a place that we can only reminiscence about in a rapidly redeveloping and forward-looking Singapore in time to come. Mat Sentul encounters a wicked flying broom in the kampung. He runs into the vegetation to evade its pursuit.